The author switches from past [Rev. 13:1-11] to present tenses in Rev. 13:12–18, though apart from producing a more vivid narrative, the reasons for this stylistic change are not immediately evident.-Aune, D. E. (1998). Revelation 6–16 (Vol. 52B, p. 757). Dallas: Word, Incorporated. The wounds are not the same. The first was a “death blow” to the head that killed it (Rev. 13:3). The second survived a sword stroke (Rev. 13:14). Although weakened it was not killed as in the first. 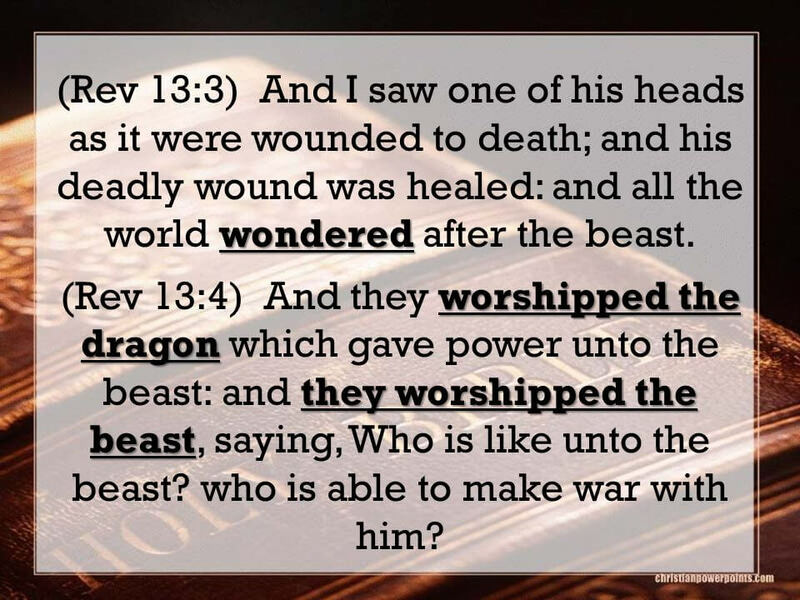 The wounded head is ancient Babylon, the wounded Beast is the Revived Roman Empire that appears in the end time. John provides the interpretive key, “the Sea”. That alludes to the “Great Sea” the Mediterranean. From whence four beasts came in Daniel 7:2-8. The first two beasts have one head each, the third beast has four heads, that totals 6 heads. Therefore, the head of the fourth beast is the seventh head (Dan. 7:2-7). The final form of the empire (eighth king Rev. 17:11) is the Grecian Roman Empire is the final ten-horned ten-toed form (Dan. 2:44; 7:7) containing the rebuilt city of Babylon. Confirming Revelation’s end time Roman Empire Beast having seven heads and ten horns is a composite of Daniel’s last beast, the same animals leading up to it are in both. But notice the order of appearance is reversed, in Daniel its lion, bear then a leopard. In Revelation its leopard, bear then a lion. This confirms they are not the same beast. 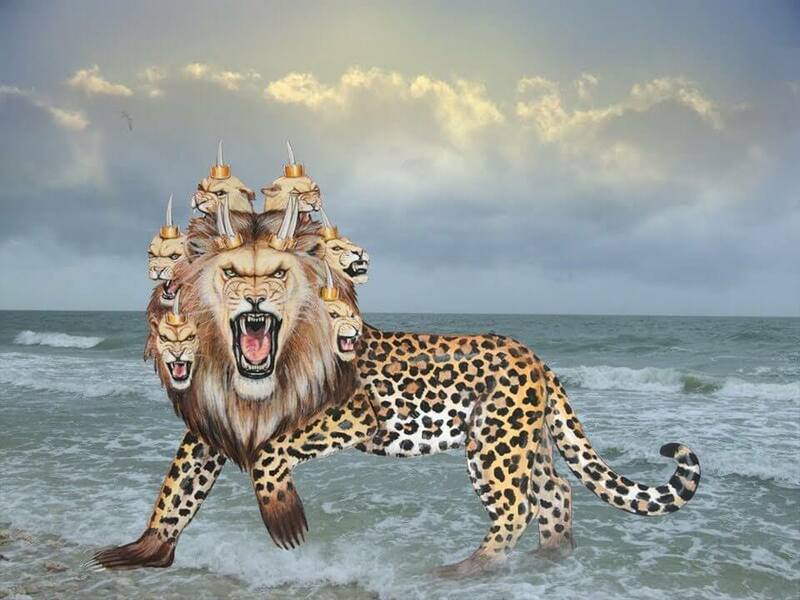 Unlike Daniel’s seven successive kingdoms rising from the sea, John’s Beast rises from the sea a single kingdom FROM them. Therefore, the ten horned version of Daniel’s fourth beast, is the John’s beast having seven heads and ten horns. But the actual kingdoms are different in John, he is looking from the end time into the entire span of human history whereas Daniel was looking from Babylon onward. The seven great empires of history 1)Old Babylonian, 2)Assyrian, 3)New Babylonian, 4)Medo-Persian, 5)Grecian 6)”one is” Roman 7)British Empire. British empire whose mandate over Palestine was only a short while is the seventh head. The Balfour Declaration supported the establishment of Israel but Britain’s mandate over Palestine was short lived. This is consistent with Scripture listing only nations that impacted Israel in a meaningful way. The League of Nations/United Nations isn’t a kingdom and never did anything binding. America makes her appearance with Britain as the Beast with two horns like a lamb. Therefore, the wounded head (old Babylon) “was and is not” (in ruins) and is healed (restored in the Grecian Roman Empire) and so “of the seven” but itself is an eighth king (Rev. 17:11) and goes off into destruction. This Final Version of the Roman Empire and the power of Emperor Adonikam is wounded by a sword when Russia, Iran and Turkey reject the new World Order. They are the forces from Babylon’s North that destroy her (Jer. 50:41-42; 51:47-48). It then goes off into total destruction fulfilling the OT prophecies (Jer. 50:3, 13, 39-40; 51:29. Rev. 18:2-10). Although Babylon’s destruction causes global Economic Depression (Rev. 18:11), Emperor Adonikam and his beast kingdom survive the wound. Then the formerly Christian (and liberty loving free market) nations of Britain and America unite under a “False Prophet” President or Prime Minister and ally themselves with Antichrist Beast. Against this alliance Russia, Iran and Turkey cannot war. They stand down and join the Beast’s Federation. Therefore, the wounds are completely different. The wounded head was the ancient kingdom of Babylon restored in the ten horn Grecian Roman Empire that rises in the end time. The wounded Beast is that Empire Beast when its rebuilt capital city of Babylon is destroyed by the sword by forces from her North. It survives and regains control with the aid of the two horned beast like a lamb Britain and America. Now speaking like a Dragon, they support the Antichrist, totalitarianism and controlled markets. Adonikam the “man of sin” false Christ who morphs into the Beast Son of Destruction after 3 ½ years (2 Thess. 2:3-4) also ascends from the abyss (Rev. 11:7) because he is the literal seed of Satan, a hybrid angel human creation. Satan craftily spoke through a serpent corrupting Eve from the simplicity of God’s truth beguiling her to eat (2Cor. 11:3) from the tree of knowledge (Gen. 3:1-6). Satan is called a cedar tree (Ezek. 31:8-11), whom the fallen angels followed (Ezek. 31:6). Christ “the ruler of the nations” and His angels will cast them into “the pit” (Ezek. 31:11-14). In Ezekiel 31:3 this “cedar” is called Assyria, his “seed” then would be “the Assyrian” (Mic. 5:5-6; Isa. 14:25-27), the apostate Jewish Christian named Adonikam (King of the North) Satan’s seed (Gen. 3:15).